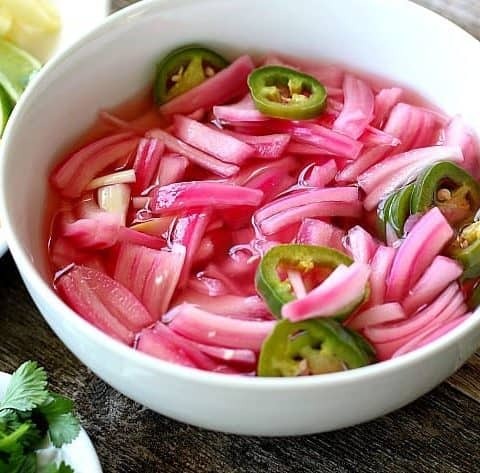 Pickled Red Onions are one of those condiments that when you make it for one use, it quickly becomes clear that its uses are endless. 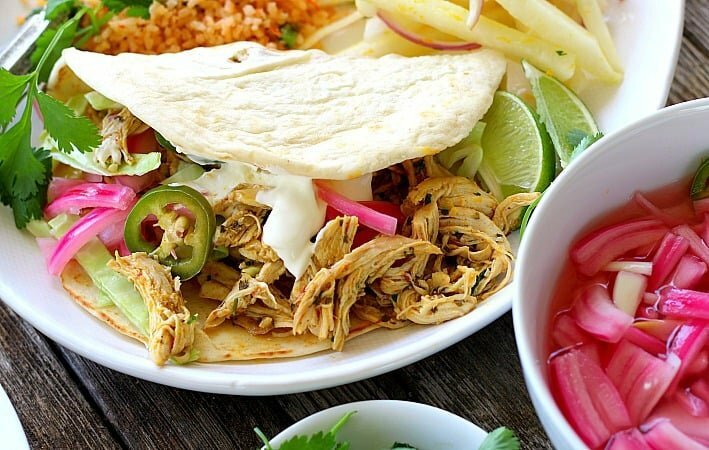 I first made the onions to accompany my Easy Chicken Tacos, a recipe for your stovetop or Instant Pot (or other pressure cooker device). And for this meal, the pickled onions turn out beautifully and were just right in the tacos, but as it made a pretty good amount, we found ourselves using it- as one friend who tried the recipe told me… “on EVERYTHING”. 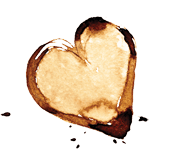 More on some of the other uses for this condiment in a minute. But first, let’s make the Pickled Red Onions. Red onions are best in the recipe mostly because of their color. The purple-y flesh turns a brilliant pink as they marinate. But they also have a milder flavor than white or yellow onions, but if those are all you have on hand, they’re perfectly acceptable. Halve the onion and cut it into slices, then slice up some jalapeno peppers. If you don’t like any heat at all you can slice the jalapenos into julienne pieces, cutting out the spine and seeds. If you really like heat, add in a few habanero peppers along with the jalapenos. A mixture of white wine vinegar, lime juice, and a touch of sugar are boiled on the stove top to liquify the sugar (you could also use a sugar substitute of your choice), then while still hot, the liquid is poured over the onions and peppers. Thirty minutes in the fridge is all the time needed to incorporate the flavors and turn the onions bright, but I actually prefer to make Pickled Onions the day before serving. The flavors become even more cohesive, the peppers calm down a little and obtain a hint of sweetness, and here’s one less dish you need to prepare the day of your dinner or party. 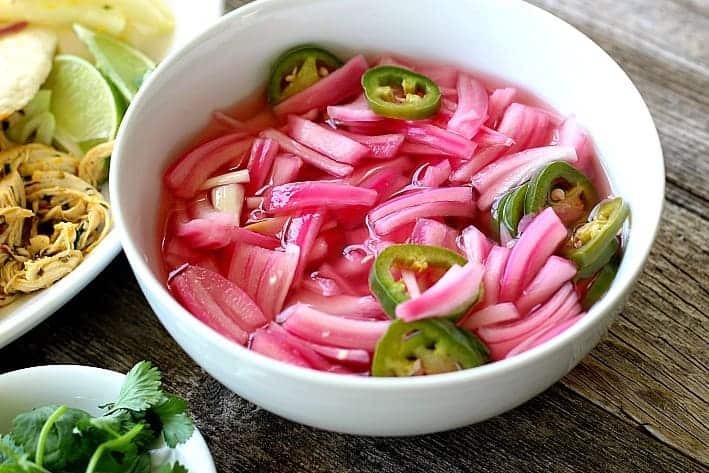 If you have leftover pickled red onions, they’re excellent with scrambled eggs or over corned beef hash or any breakfast potato or casserole for that matter. Serve it with pork chops or shrimp, quinoa or rice dishes… See? Pretty much everything. Leftovers will keep up to 3 days, refrigerated in air-tight containers. 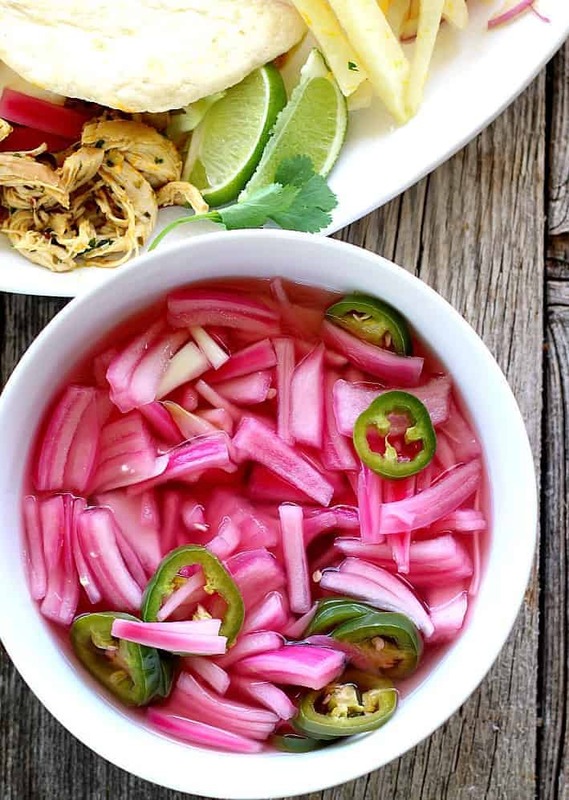 Super easy, super pretty, and super tasty, Pickled Red Onions are not your standard relish-type accompaniment, but once you make them, you’ll pretty much always want some ready to go for that perfect “something” that your next dish might need. 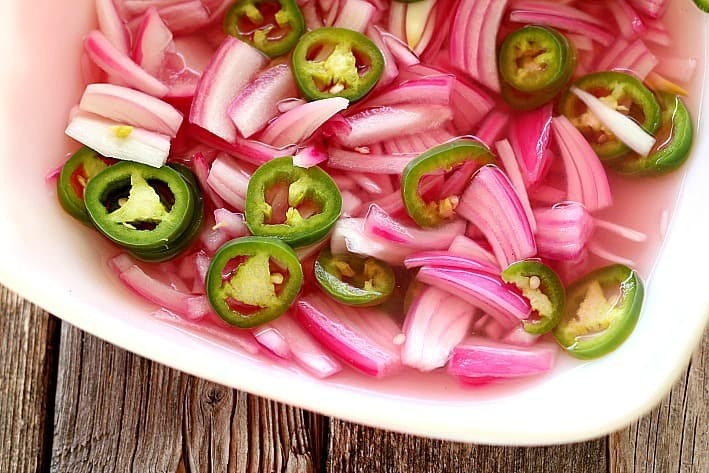 Pickles red onions with sliced jalapeno chiles make a delicious addition to any taco bar or shredded chicken, beef, or pork meal. This recipe makes a good quantity and Yay! for that because they add nice flavor to scrambled eggs, roasted potatoes, or anything that needs some extra crispy flavor and mild heat. 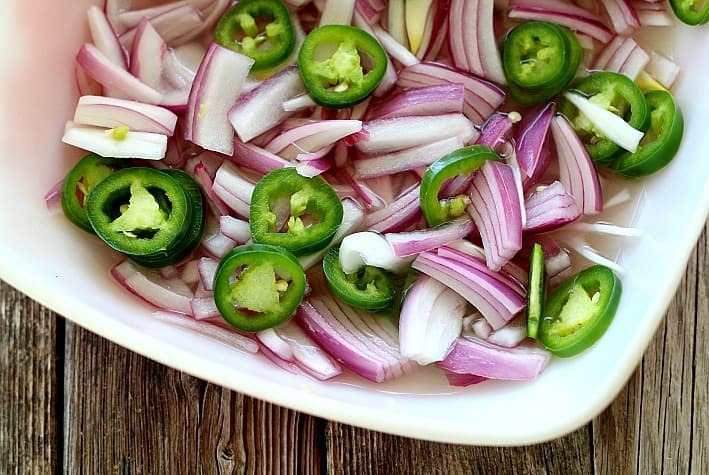 Combine onion and jalapenos in a medium bowl. Heat a small saucepan over medium high heat and add vinegar, lime juice, sugar, and 1 teaspoon salt. Bring to boil and then pour vinegar mixture over onion mixture. Let sit for at least 30 minutes, or refrigerate for up to 2 days. For more heat, add an extra jalapeno or even a habanero to the mix. If you're making the onions to serve with tacos of any kind, here's a nice variation especially good with fish tacos. Before serving, shred a small head of green cabbage until you have about 3 cups. Add 1/4 cup of the onions' pickling liquid the the cabbage, add 1/2 teaspoon of salt and 1/2 teaspoon of black pepper. Toss and serve with the onions, and other taco accompaniments. I made this for your Easy Chicken Tacos. Both are wonderful. Combined the leftover chicken and onions over crunchy lettuce for my work lunch. So good either way. Thanks for this! Hi Tish, we love it on every type of taco recipe I make. Let me know what you think of them. Thanks for stopping by to comment!